But here’s a recipe for the delicious Cajun-inspired meal I made last night. It was so simple, and so delicious, I had to share it! 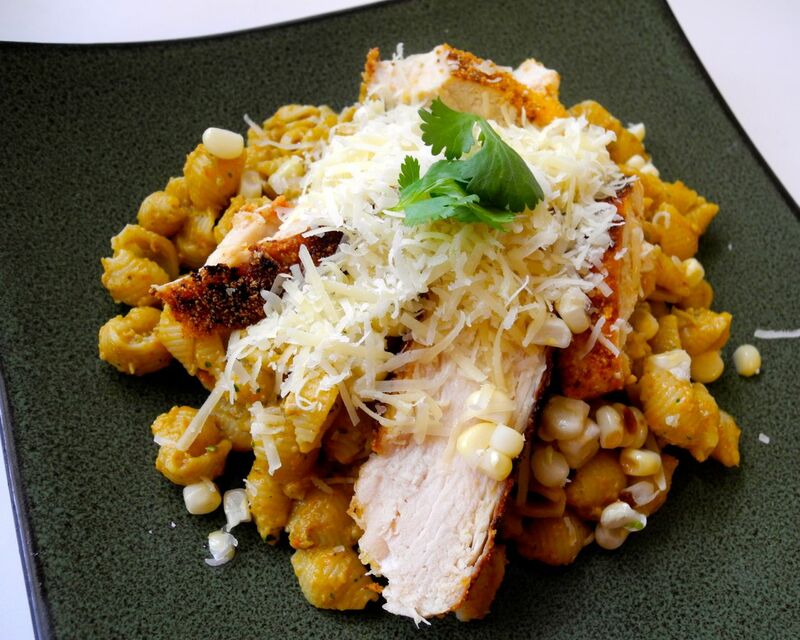 Crispy Cajun chicken, pasta with a creamy avocado sauce, grilled corn, and all topped with sharp white cheddar. To get started, put a pot of water on the stove to boil for the pasta. Then flatten out the chicken breast with a meat mallet. I love meat mallets! Seriously, one of my favorite kitchen gadgets! 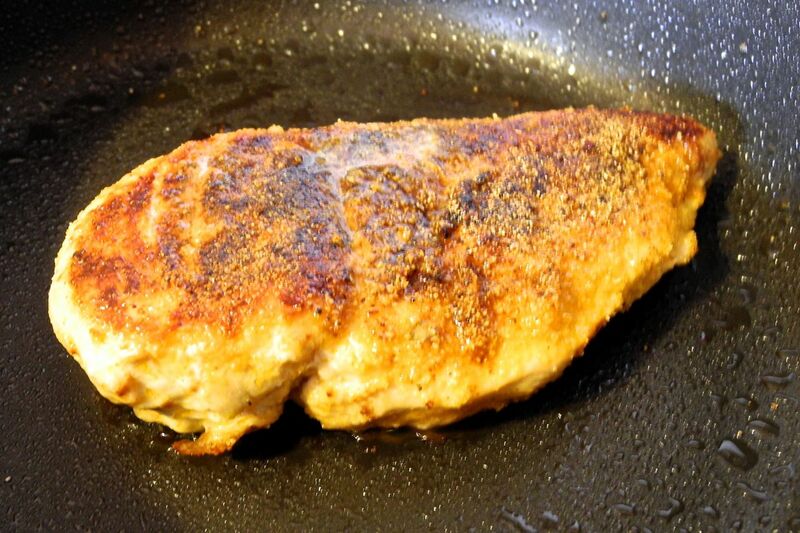 Cooking a whole chicken breast on the stove or grill can take a long time, especially the huge, thick ones you always seem to get these days. And cutting raw chicken is 1) gross and 2) time consuming. But flatten it out a bit with a meat mallet, and it cooks so much faster! Then if you need it in smaller pieces, slice it up after it’s cooked. 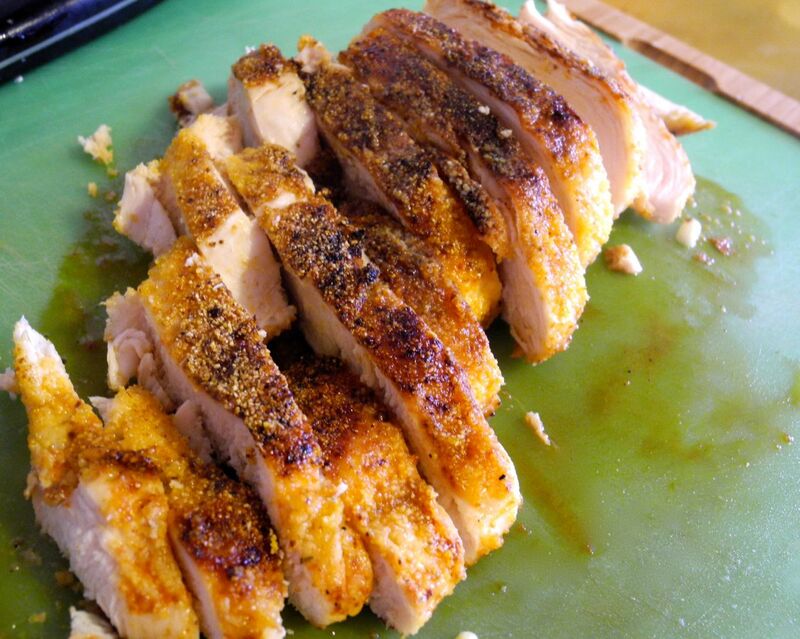 Then rub the Cajun seasoning and corn meal into the chicken, and toss it in a pan with a little olive oil. Once the bottom side is nice and crispy and browned, turn it over and keep cooking until golden, or even slightly blackened. The corn meal gives it a nice crispy texture on the outside. When the pasta is done cooking, drain it and return it to the pan. Stir in the sauce, and heat through. It doesn’t need to really cook, just heat. Slice the chicken, cut the kernels from the corn, and shred the cheese. 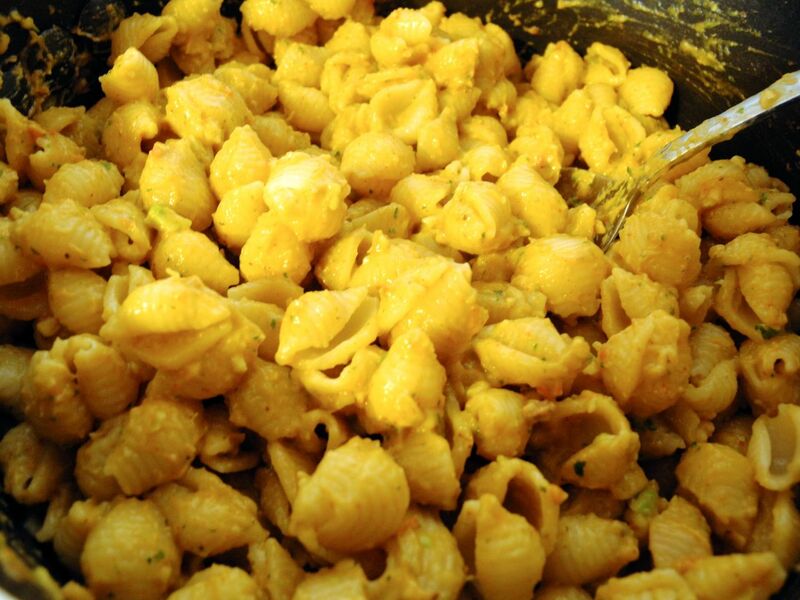 Serve the pasta onto plates, and top with chicken, corn, cheese, and a few extra sprigs of cilantro. Enjoy! I also make my own Cajun seasoning because the packaged stuff is soooo full of salt and other random preservatives, which is silly because it’s just spices and spices don’t have them. Anyway, you can just use a store-bought Cajun seasoning, or make your own. This will make more than you need for this recipe, but you can save it for other recipes, like Cajun fries! 1. Put a pot of water on the stove to boil for the pasta. Heat the olive oil in a frying pan. 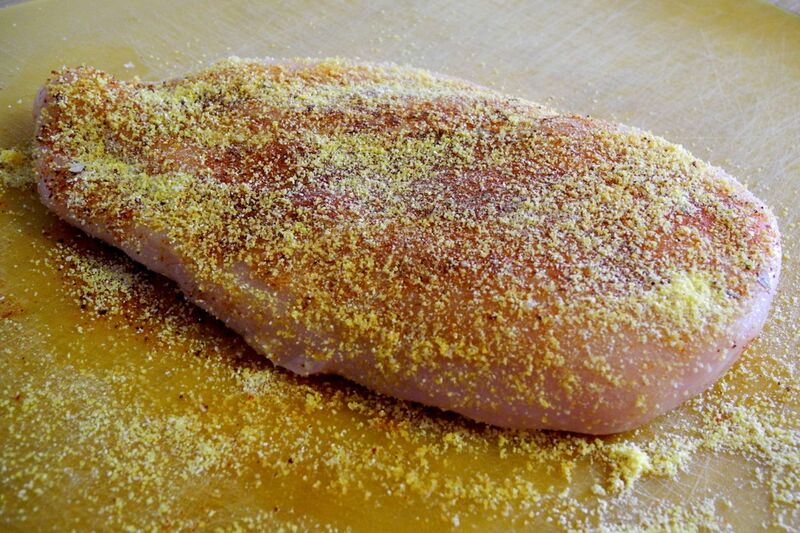 Flatten the chicken with a meat mallet, and rub with the Cajun seasoning and corn meal, and add to the frying pan. Cook until golden brown on the bottom, then turn and continue cooking. 2. When the water come to a boil, add the pasta and cook according to package directions. 4. Make the sauce by putting the avocado, tomato, cilantro, lime juice, Cajun seasoning, and garlic in the blender. Puree until smooth. 5. When the pasta is done, drain and return to pan. Stir in the sauce and heat through. 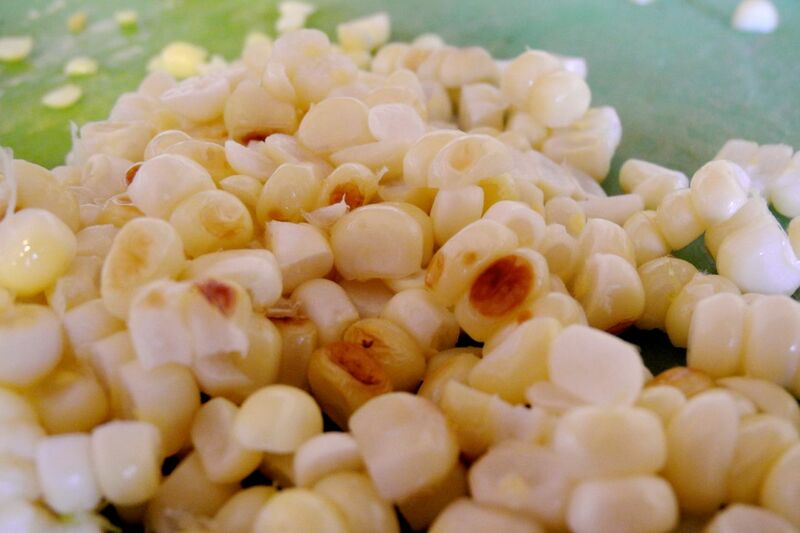 Slice the chicken and cut the kernels from the corn. 6. 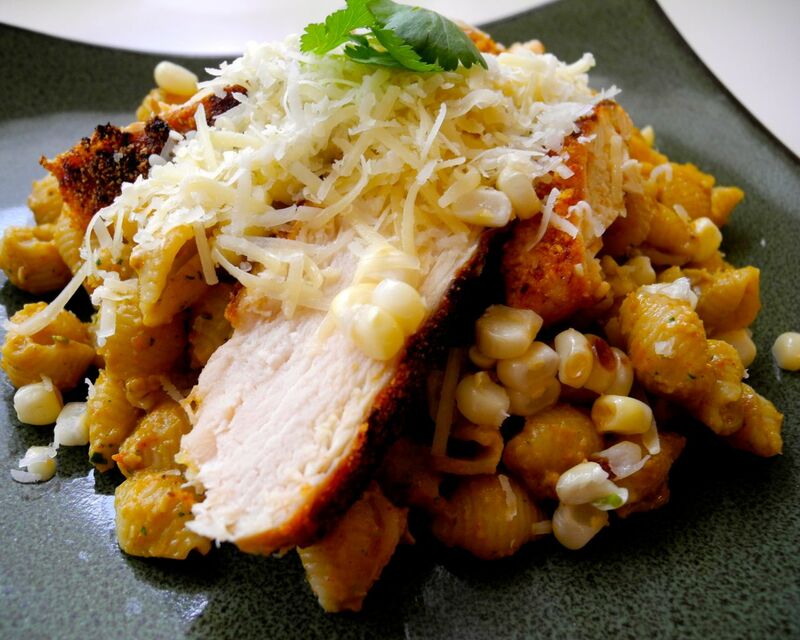 Serve the pasta onto plates and top with chicken, corn, and shredded cheese. One note – because the sauce is avocado-based, it doesn’t reheat very well. It can be saved and reheated, but it’s much better eaten fresh!